Manchester agency Delineo has launched a new e-commerce baking site for Bako South Eastern. 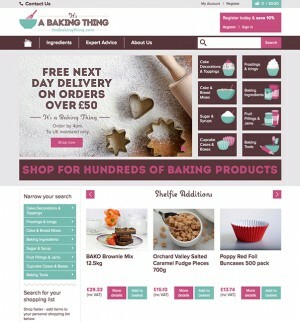 The site, Itsabakingthing.com, offers hundreds of industry-standard baking products designed to suit the needs of home bakers, as well as expert advice, recipe ideas, tips and interviews. Delineo was appointed to develop the brand, user experience and development of the site, which was launched this week at Cake International in London’s Excel Arena. Bako's group of trading, Andy Hodgson, said: "Delineo have worked with us from the origination of the name and branding through to developing the business case for the new consumer brand. "They impressed us with their passion for the market, their understanding of our business and their strategy for taking this new platform to the market. Delineo has also handled the digital strategy and has implemented a content and engagement strategy across Instagram, Facebook, Pinterest and Twitter. Delineo has recently picked up other briefs from Gazprom, Genesis Breast Cancer Prevention and the Manchester Jazz Festival.